THIS WORK LETTER AGREEMENT ("AGREEMENT") is made as of _________________, by and between COMMERCIAL PROPERTY LANDLORD, INC., a __________________ corporation ("Landlord"), and AGREEABLE TENANT, INC., a _________________ corporation ("Tenant"). A. Landlord and Tenant have entered into a Lease of even date herewith (the "LEASE"), for certain Premises (as defined in the Lease) in the Building (as defined in the Lease) to be constructed by Landlord in _____________, _______ as more particularly described therein. 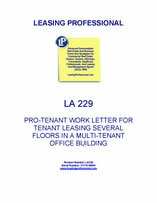 The capitalized terms used in this Agreement shall have the meanings set forth in the Lease. B. Certain tenant improvement work is to be completed by Landlord within the Premises upon the terms and conditions hereinafter set forth. 1. TENANT IMPROVEMENTS. Landlord shall perform, or cause to be performed, the tenant improvements (the "TENANT IMPROVEMENTS") as shown on the Construction Documents (as hereinafter defined) approved by Landlord and Tenant, as provided herein. Landlord currently intends to utilize ___________________ as its general contractor for the Tenant Improvements, but reserves the right to change the general contractor, so long as Landlord notifies Tenant of the change, which shall be subject to Tenant"s reasonable approval. 2. TENANT"S ARCHITECT. Tenant"s Architect as designated by Tenant (such architect, or such other architect as may be selected by Tenant, and approved by Landlord in its reasonable discretion, in substitution for such firm, is hereinafter referred to as "TENANT"S ARCHITECT". 3. LANDLORD"S ARCHITECT AND CONSULTING ENGINEERS. Landlord"s Architect as designated by Landlord (such architect, or such other architect as may be selected by Landlord in substitution for such firm, is hereinafter referred to as "LANDLORD"S ARCHITECT". Landlord"s Architect is also utilizing certain consulting engineers for civil engineering and overseeing mechanical work, each of whom have or will be designated by Landlord (such engineers, or such other engineers as may be selected by Landlord or Landlord"s Architect in substitution for such firms, are hereinafter referred to as the "CONSULTING ENGINEERS". Attached hereto as Schedule 2 are preliminary plans for the Tenant Improvements to be constructed in the Premises ("PRELIMINARY TENANT IMPROVEMENT PLANS"), which have been approved by Landlord and Tenant for purposes of indicating the scope of work for the Tenant Improvements. 5.1 Tenant shall cause Tenant"s Architect to prepare and deliver on or before _______, at Tenant"s cost and expense, to Landlord, Landlord"s Architect, the Consulting Engineers and the Design Build Subcontractors (hereinafter defined), preliminary construction drawings ("PRELIMINARY CONSTRUCTION DRAWINGS") containing sufficient information and detail to enable Landlord"s Architect, the Consulting Engineers and the Design Build Subcontractors to begin preparation of the engineering construction drawings for the Tenant Improvements, including "backgrounds" for the Tenant Improvements for engineering use. 5.2 Tenant shall cause Tenant"s Architect to prepare and deliver, at Tenant"s cost and expense, completed architectural portions of the Construction Documents (the "ARCHITECTURAL CONSTRUCTION DOCUMENTS"), to Landlord and Tenant on or before _________. 5.3 Within ten (10) business days following receipt by Landlord of the architectural Construction Documents referred to above, Landlord shall indicate its acceptance or rejection of the architectural Construction Documents in writing. Landlord shall not unreasonably withhold its acceptance of the architectural Construction Documents, as long as they are consistent with the scope of work outlined in the Preliminary Tenant Improvements Plans and Specifications. If Landlord rejects the architectural Construction Documents, Landlord shall advise Tenant and Tenant"s Architect of the reasons for Landlord"s rejection. 5.4 If pursuant to Paragraph 5.3 above Landlord rejects the architectural Construction Documents, Tenant shall submit revised architectural Construction Documents to Landlord within twenty (20) business days following receipt by Tenant of written advice of the rejection and the reasons therefor. The submission of revised architectural Construction Documents shall be accompanied by a point by point written response from Tenant specifically responding to any disapprovals or other responses delivered by Landlord to Tenant. 5.5 If Tenant is required to submit revised architectural Construction Documents pursuant to Paragraph 5.4 above, Landlord shall indicate its acceptance or rejection of the revisions within five (5) business days following receipt by Landlord of the revised architectural Construction Documents. If Landlord rejects the revisions, Landlord shall advise Tenant and Tenant"s Architect of the reasons for the rejection. If the rejection is based on Tenant"s failure to remedy a reason or reasons for rejection specified by Landlord pursuant to Paragraph 5.3 above, the delay attributable to all further revisions of the architectural Construction Documents required to correct such reasons for rejection shall constitute Tenant Delay under Paragraph 12 below and accordingly shall not result in a delay in the Commencement Date or the rental and other obligations in the Lease. 5.6 The parties contemplate that the final Construction Documents will be completed and approved by all parties by ___________. 6.1 Landlord"s Architect, Consulting Engineers, and/or the Design Build Subcontractors, as applicable, shall prepare and deliver to Landlord and Tenant, at Tenant"s cost and expense (subject, however, to Paragraph 13), the applicable engineering portions of the Construction Documents, including, but not limited to, fire protection, H.V.A.C., electrical, life safety, plumbing and, if applicable, structural drawings and specifications (the "ENGINEERING CONSTRUCTION DOCUMENTS", which together with the architectural Construction Documents are collectively referred to as the "CONSTRUCTION DOCUMENTS"). 6.2 Landlord and Tenant acknowledge that certain portions of the Tenant Improvements shall be designed and constructed by subcontractors of Landlord"s general contractor on a design-build basis ("DESIGN-BUILD SUBCONTRACTORS"), that have been selected at the time Landlord bids the Base Building Work, including the H.V.A.C., electrical, plumbing, and life safety systems which are part of the Tenant Improvements. The Design Build Subcontractors shall be selected based upon competitive pricing for the building systems included in the Base Building Work and unit pricing for the Tenant Improvements (which unit pricing shall be subject to Tenant"s approval, not to be unreasonably withheld, conditioned or delayed). Upon receipt of the Construction Drawings, Landlord"s general contractor shall price the design-build portions of the Tenant Improvements with the Design Build Subcontractors, based upon unit-pricing and unique items and shall obtain Tenant"s approval of the costs for each of the Design Build Subcontractors, which approval shall not be unreasonably withheld, conditioned or delayed. Any rejection must specify in writing the reasons for rejection, and the changes to the Construction Drawings or the costs needed to obtain Tenant"s approval. If agreement on costs cannot be reached with the applicable Design Build Subcontractor, Landlord shall cause Landlord"s general contractor to re-bid the applicable portion of the work, and the lowest responsive bidder shall be awarded the work. Any delays caused by rejection of costs of any Design Build Subcontractor and/or any rebidding shall be deemed Tenant Delay under Paragraph 12 below. 6.3 Following selection of the Design Build Subcontractors, Landlord shall cause Landlord"s Architect, the Consulting Engineers and the Design Build Subcontractors, and Tenant shall cause Tenant"s Architect, to coordinate the timely preparation of such engineering Construction Documents with the preparation of the architectural Construction Documents pursuant to Paragraph 5 above, allowing a minimum of two (2) months following receipt of the Preliminary Construction Documents, for preparation of the engineering Construction Documents, which shall be prepared concurrently with the final preparation of the architectural Construction Documents. Within ten (10) business days of receipt of the engineering Construction Documents, Tenant shall indicate its acceptance or rejection in writing. If Tenant rejects any portion of the engineering Construction Documents, Tenant shall advise Landlord in writing of the reasons for Tenant"s rejection. Landlord"s Architect, the Consulting Engineers or the Design Build Subcontractors, as the case may be, shall then, at Tenant"s cost and expense unless such revisions are made necessary by reason of an error on the part of Landlord"s Architect, the Consulting Engineers or the Design Build Subcontractors revise the applicable portion of the engineering Construction Documents within twenty (20) business days following receipt of Tenant"s requested revisions. The revised engineering drawings shall be delivered to Tenant, and the revisions shall be subject to Tenant"s approval or rejection, which shall be given in writing within five (5) business days of receipt. The final engineering Construction Documents approved by Tenant must also be approved by Landlord.